Quick overview Reflecting on the personal and ideological tensions within Labour and its successes and failures in power, he describes how to meet the challenge of pursuing a radical agenda within a credible party of government. Former Prime Minister and the country's longest-serving Chancellor, Gordon Brown has been a guiding force for Britain and the world over three decades. This is his candid, poignant and deeply relevant story. In describing his upbringing in Scotland as the son of a minister, the near loss of his eyesight as a student and the death of his daughter within days of her birth, he shares the passionately-held principles that have shaped and driven him, reminding us that politics can and should be a calling to serve. Reflecting on the personal and ideological tensions within Labour and its successes and failures in power, he describes how to meet the challenge of pursuing a radical agenda within a credible party of government. He explains how as Chancellor he equipped Britain for a globalised economy while swimming against the neoliberal tide and shows what more must be done to halt rising inequality. In his behind-the-scenes account of the financial crisis and his leading role in saving the world economy from collapse, he addresses the question of who was to blame for the crash and why its causes and consequences still beset us. 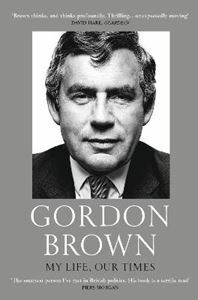 From the invasion of Iraq to the tragedy of Afghanistan, from the coalition negotiations of 2010 to the referendums on Scottish independence and Europe, Gordon Brown draws on his unique experiences to explain Britain's current fractured condition. And by showing us what progressive politics has achieved in recent decades, he inspires us with a vision of what it might yet achieve today. Riveting, expert and highly personal, this historic memoir is an invaluable insight into our times.